The most inspired jigging weapon of the year. 2 nd generation advanced 99% high performance graphite blank construction with PYTHON wire wrapping surface brings you to the new level of excitement – stiffer, stronger, more sensitive responsive. 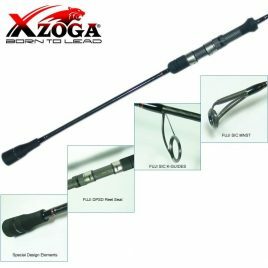 Perfectly tuned 4 point Power Transmission Fighting (PTF) action and super thick inner wall increase the torque lifting power while distributing the power of rod better than ever. Equipped with 100% Japan FUJI components, V9 superb performance SS concept design, Black Buster will be your best partner in jigging world.